The Dark Horse Bar & Eatery in St. Paul’s Lowertown is a perfect spot for unwinding after a long day of pretending to like your co-workers. 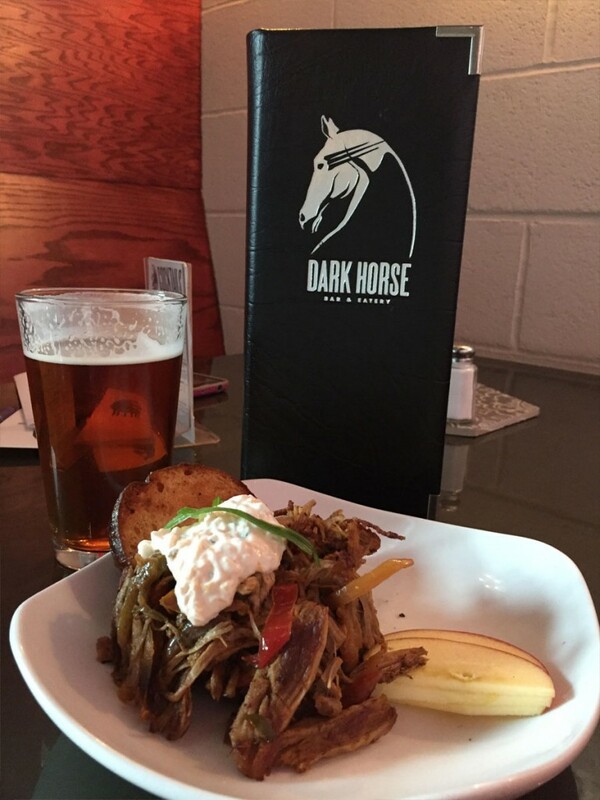 Opening just over a year ago, the Dark Horse Bar & Eatery has a cool vibe- a trendy, industrial style setting, complete with exposed beams and vaulted ceilings. Nestled in a rediscovered area of Saint Paul, you’ll find parking is easy and walking to a Saints game or filling up on gas is convenient. You will be greeted and served by friendly staff who are chatty and informative, but won’t interrupt your “after 5” water cooler banter. The outdoor patio shouldn’t be missed. Lined with primitive wooden-spool tables (each retrofitted to house your very own, cozy fire place) this warm, rustic space creates a kind of outdoor bonfire experience. While you’re enjoying their lighted patio, the staff will be sure to remind you of last call for Happy Hour. Happy Hour wine is served from the box at $3 per glass. You’ll also find a selection of canned beers such as Grain Belt Nordeast, Lone Star, Hamm’s and New Belgium Fat Tire at $2.75. All tap beers are $1 off. There’s a long list of locally brewed tap beers from Summit and Indeed for $4. Drink specials end at 6pm. If you arrive between 3-5pm, you can enjoy shrimp tacos, pulled pork sliders or a micro shank in sweet BBQ sauce for $5. You can also order one of their hand tossed pizzas, two toppings at $11. And for lighter fare, a wedge salad at $7. *Be sure you order by 5pm as food specials end at 5pm. The seasoned pork sliders are served on a toasted pretzel bun with smoked gouda, peppers and covered in a heavenly, creamy, whipped goat cheese. This sweet and savory Micro Shank is so tender the meat will simply slumber off the bone and melt in your mouth. It’s served with a slightly sweet BBQ sauce that offers just a tinge of spicy hot. We suggest ordering the hand-cut fries. Although not on the Happy Hour Menu, these fresh, crispy, fries, are a perfect complement to any of the appetizers. Tossed in herbs, they are served with Dark Horse’s homemade ranch dressing. You will want to dip everything in this godly nectar, for reals. 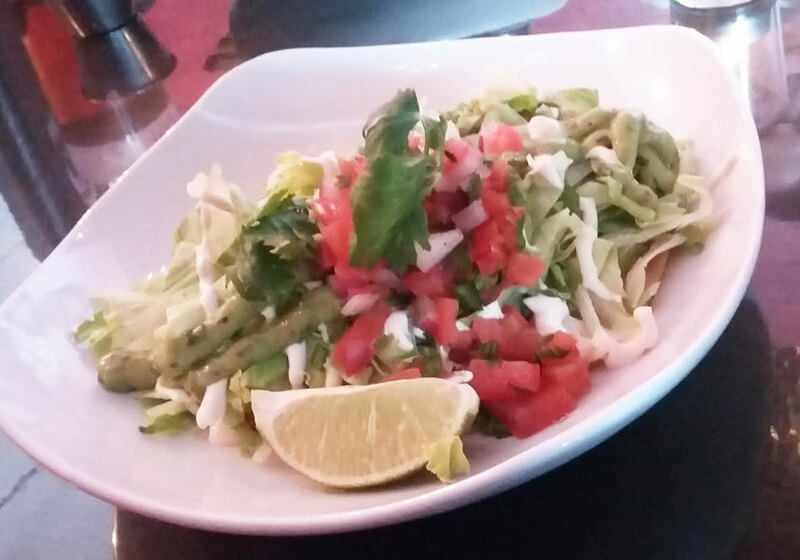 Generously sized, this lightly breaded shrimp is covered in an array of ultra fresh veggies, avocado puree, cilantro and a ghost pepper crema. Watch out! This senorita is hot! If you want to play it safe, order the crema on the side-a. Order “the Hamilton” only don’t call it that at the Dark Horse because we just made it up. For $10 you can have either the ample Shrimp Taco or the Pulled Pork Slider, a glass of wine or a can of domestic beer and, with tip, you are out the door with no more than a $10 spot missing from your pocket. 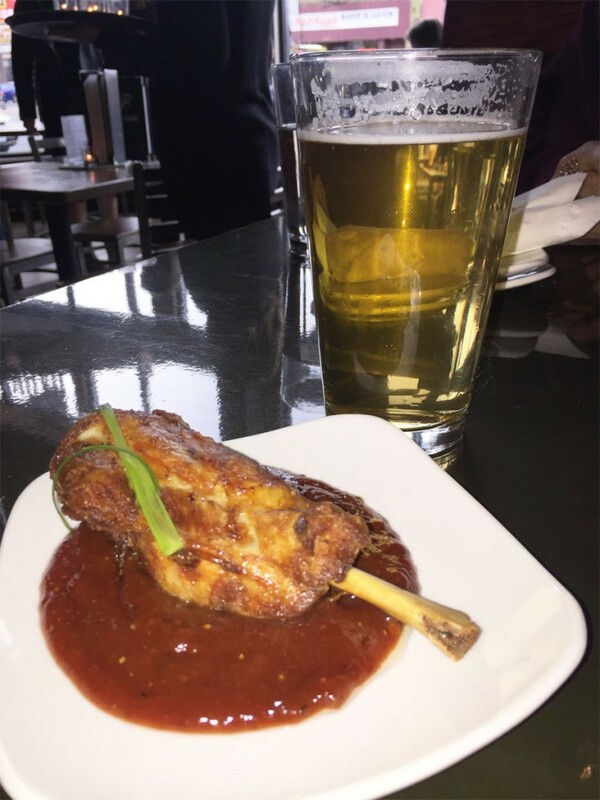 Chix Say, "The Dark Horse is a perfect spot for unwinding after a long day of pretending to like your co-workers." Writing about food, wine, beer and cocktails is familiar turf for Suzanne. In her once nomadic past (Phoenix, Chicago, the Twin Cities) Suzanne worked in just about every kind of establishment from hipster wine bars, to chain restaurants, patio bars, sports bars and fine dining. A native Minnesotan, and U of MN alumna, Suzanne majored in English which aptly prepared her for a career in the service industry.